Bristol extended their losing run to nine competitive matches as Bath came out in top in the first meeting between the West Country sides in seven years. Bristol’s run now stretches to 155 days, however Andy Robinson’s side started the better at The Rec after the dazzling footwork of academy graduate Billy Searle put Bath under pressure. However, despite winning the territorial battle, silly mistakes at the breakdown allowed Rhys Priestland to continue his impressive kicking form giving the home side a 12-3 lead at the break. An uneventful second half saw Shane Geraghty knock over a penalty to give Bristol a slim lifeline, but record try scorer Matt Banahan went over with the clock in the red to make it two wins from two in the Challenge Cup for Todd Blackadder’s men. Sale remain winless in the Champions Cup after two rounds, despite a spirited performance against champions RC Toulonnais at the AJ Bell Stadium. Toulon started the better, racing away into an early lead after Charles Ollivon put the home side ahead after a Leigh Halfpenny penalty opened the scoring. The full back from Wales himself then got on the scoresheet with a try of his own and with Magnus Lund in the bin, things were looking already very ominous for the Sharks until Paolo Odoguwu got over the line to get the home side up and running. 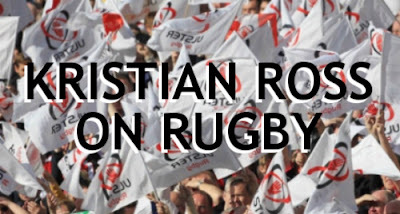 Despite the usual machine like efficiency of Toulon, they failed to make an impact in the second half and with fifteen minutes to go, Sale pressed into the Toulon twenty-two. But poor game management meant they came away with nothing, despite having three kickable penalties, they opted for the corner each time as a scoreless second period came to a close and left Steve Diamond’s team without even a losing bonus for their efforts. Saracens made it two wins from a possible two in the Champions Cup as they saw off a spirited Scarlets side at Allianz Park. Scarlets had Rhys Patchell to thank, as his efforts from the boot produced fourteen points alongside tries from Jonathan Davies and Steve Shingler in the second half. But despite only an eleven point differential at the break, Saracens hit high gear again and despite not being at their full best, crossed the line with Marcelo Bosch, Michael Rhodes and Chris Wyles along with earlier scores from Mako Vunipola and Nick Thompkins. The win now means Saracens harbour a five-point birth at the top of Pool 3. Northampton crashed back down to earth after a huge loss in France at the hands of Top 14 side Castres on Saturday. Jim Mallinder’s side who have already came under pressure this season seemed to have stopped the rot after a narrow win opened their Champions Cup account last week, but the Saints were blown away as the Stade Pierre-Antoine. In the first half, the Premiership side failed to register a single score as they fell behind 20-0 after tries from David Smith and Antoine Tichit. James Wilson did get over the whitewash for a consolation but another try from Smith in the second period along with added punishment via Alexandre Bias and Antoine Dupont left the away side with a big dent in their hopes of a quarter final place. Paddy Jackson nailed a vital drop goal with two minutes left as Ulster narrowly overcame Exeter as the Kingspan Stadium. A topsy-turvy last ten minutes in which the lead changed three times finally came to an end when the Irish number two out-half grabbed three points after Belfast born Gareth Steenson looked to have stolen the win for the Chiefs, who had been trailing 10-6 at half time. Sean Reidy scored the only try of the game in an attritional encounter, which became the battle of the fly halves. It now leaves qualification for Rob Baxter’s men very unlikely after a second consecutive Champions Cup defeat. Gloucester maintained their 100% record in this seasons Challenge Cup with a routine win over Benetton Treviso at Kingsholm. An impressive display saw Gloucester race into a 20-3 lead at the interval in a match that their PRO12 counterparts provided very little resistance. Jonny May, Matt Scott, Callum Barley and Lewis Ludlow all made sure of a bonus point as Gloucester put their Premiership woes behind them to produce an entertaining afternoon for their fans. Michael Tagicakibau’s try was the only moment that the Italian travelling support had to smile about on a day that firmly belonged to the cherry and whites. It means maximum points for David Humphrey’s team who are pipped to top spot in their pool by Stade Rochelais on points difference. Worcester remain bottom of their Challenge Cup pool after a disappointing one-point defeat saw them fall short against Brive at Sixways. After losing against Enisei-STM in Siberia the week previous, the Warriors knew a defeat on home soil would leave them with a near on impossible task of progressing through and they found themselves behind Taku Ngwenya’s score. However, Worcester were only three behind at the break as they were awarded a penalty try. Talismanic back Ben T’eo put the Premiership side ahead but they failed to capitalise as Thomas Aquier and Said Hireche extinguished any hopes of a fightback. Andy Short grabbed a late score, but Brive never looked like not holding on as the West Country side were forced to endure another miserable day of European action. Edinburgh took a huge win against Harlequins as Murrayfield produced the game of the weekend in the Challenge Cup. In a game with thirteen tries (two of which were awarded as penalties via the referee), Tom Brown’s late five pointer was the difference as the Gunners made sure they made it a second consecutive win in the pool. Allan Dell, Nasi Manu, Blair Kinghorn, Damien Hoyland and Hamish Walker all crossed for the home side in the capital. Kyle Sinckler, Charlie Walker and Mat Luamanu were on the scoresheet in a sumptuous encounter that provided drama until the very last. Leicester saw off Racing 92 despite an attempted comeback at Welford Road on Sunday night. The home side who were mauled by Glasgow in the previous week were quick out of the blocks as Brendon O’Connor went over the line. Dan Carter provided the only points for the French champions in the first half thanks to a penalty. However, the New Zealand record points scorer converted his own second half try as Racing got back within a single point. But an ingenious substitution saw Freddie Burns come on and take the game by the scruff of the neck, first nailing a tough penalty and then intercepting via an attack from the away side to all but seal the game for the Tigers. A late try from Juan Imhoff gave the travelling faithful hope, but another well executed kick by Burns before the final whistle made sure of a Leicester win and deny the visitors what could be a crucial bonus point. Wasps denied Toulouse a much needed Champions Cup win as they remained unbeaten in the competition with a draw at the Stade Ernest-Wallon. In a game that both sides were very well matched, Toulouse should have picked up a first win of the season in Europe but Jimmy Gopperth continued his incredible season by securing two points with a pressure conversion after a try from Nathan Hughes. Both teams had been level at the break as well as the final whistle, with the score 6-6 at half time. Cenus Johnston and Gael Fickou went over for Toulousain as Sébastien Bézy kept the scoreboard ticking over. Josh Bassett scored Wasps second try in an afternoon that seemingly felt like a win for the visiting squad, but a defeat for the home team. Newcastle bounced back from their nightmare 45-0 defeat by Ospreys in round one to hammer Grenoble on the artificial pitch at Kingston Park. The Falcons had the bonus point wrapped up before half time thanks to tries from Sonatane Takalua, Will Welch, Will Witty and Mark Wilson. Scott Lawson (2), Ben Sowerby and Olympic silver medallist Marcus Watson got Newcastle’s second half scores as they ran riot on a wet and windy afternoon. Joel Hodgson came away with ten points converting five of the seven tries. Grenoble did grab a consolation thanks to Eddie Sawailau, but it was a day to remember for Dean Richard’s as they put themselves back into contention for the next round. Newcastle – After a disgrace of a performance last week against the Ospreys, Newcastle were superb in their dismantling of Grenoble on Sunday. Not often do the fans at Kingston Park see big wins, especially over French side, but the home side produced a well-rounded display to get maximum points. Leicester – Following a gruelling defeat in round one to Glasgow, another banana skin was on the cards as Leicester took on star studded Racing albeit on their home patch. Freddie Burns was the difference, his influence effectively won the match for the Tigers and kick-started their Champions Cup campaign with a very well deserved win. Gloucester – Saracens could have got the final place in the winner’s column this week, but it goes to Gloucester who managed to beat Treviso on Saturday. Admittedly, the home side haven’t been great this season, but credit to the cherry and whites who are now joint top of their pool. Northampton – Many had thought that Northampton had turned a corner after last week’s win, but a total humiliation last week has given fans much to wonder yet again. Once more, the pressure on Jim Mallinder is surely there, Saints look to be regressing and they now can’t afford any more slip ups if they are to qualify for the quarter finals. Worcester – Another bad day at the office for Worcester. Last week’s cold chill in Russia was followed up by a French freeze as Brive took the spoils at Sixways. Admittedly, the opposition this week regarded in higher esteem, but the Warriors left it too late and have lost both their matches in the Challenge Cup. On the plus side, two losing bonus points.